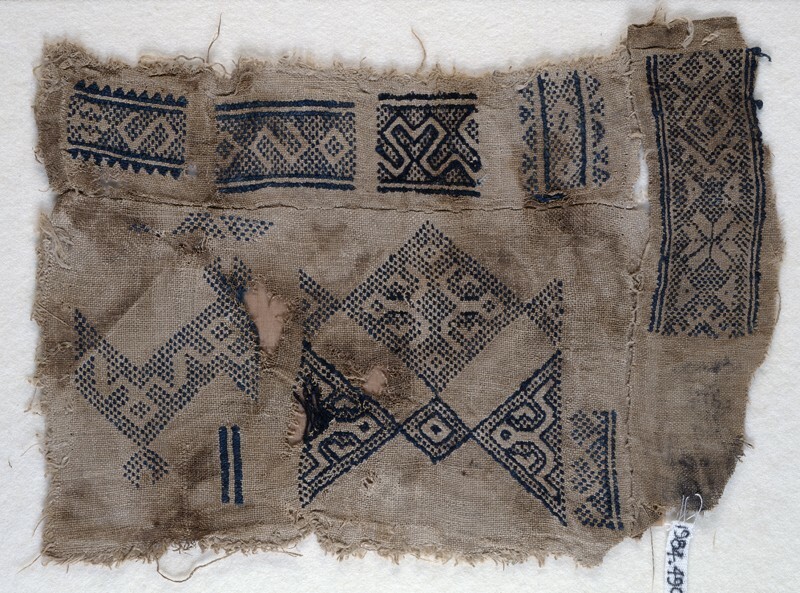 A sampler fragment with six rectangles, two squares set up as diamonds and linked to triangles, and a chevron. They are filled with S-shapes, hook motifs, and continuous curving lines. The fragment is sewn together from three linen pieces. The nine band patterns recorded on this sampler are embroidered so that the motifs are in reserve; the ground is covered in little dots formed by pattern darning in running stitches over and under two threads in alternate lines. Sometimes the ‘voided areas’ have been defined by threading cotton through the stitches along the edges, adding emphasis to the linear quality of the design. A substantial number of fragments in the collection were worked in this manner, ranging from ones with narrow and wide bands of geometric pattern to others with repeating motifs placed in offset rows. The S-and Z-shapes, double arrowheads, stars and whirling rosettes, so typical of Mamluk design, look particularly effective when thrown into relief by this arrangement of pattern darning.